Following on the heels of my most recent post on City Lights Books… Writer Jack Kerouac (1922-1969) was born in this old mill town to French-Canadian parents, and did not learn to speak English until he went to school. Kerouac left Lowell at 17 for New York City, where he briefly attended Columbia University. In 1944, his girlfriend, Edie Parker (later his first wife), introduced him to Allen Ginsberg and William S. Burroughs, and the triumvirate formed the core of the Beat poets. Kerouac’s most famous novel, On the Road (1957), was written in three weeks on a scroll that he made out of sheets of paper taped together so that he could type without interruption. A tour of the scroll began making its way to universities and museums around the country in 2004. Kerouac married three times and had one daughter. (Also a writer, Jan Kerouac committed suicide in 1996.) He also had a variety of male lovers, among them his fellow Beats and writer Gore Vidal. An alcoholic, he died young of complications of the disease. Lowell erected this sculpture to its native son in 1988, after several years of dispute about whether the town should memorialize an alcoholic. Citing his literary contributions, Kerouac supporters won out, and Ginsberg read some of his early poems at the dedication. “Kerouac is the heart and spirit of what has brought us together!” Ginsberg proclaimed. 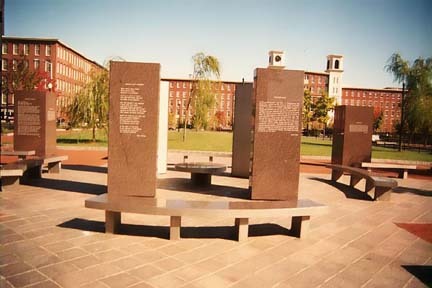 The granite panels, created by artist Ben Woitena, are inscribed with excerpts from Kerouac’s work, including the opening paragraph of On the Road. There are other tributes to Kerouac in different parts of the country. Most notably, the bungalow in Orlando, Fla., where Kerouac was living when On the Road was published and where he wrote much of The Dharma Burns (1958) now houses the Jack Kerouac Project, a residency program for writers.